Adding new features can be a challenge for any company. With so many ideas, the tendency is to just start building, but without a strategy how do you know if you’re building the right features. Continually incorporate feedback from end users and treatment centers as we review current features and develop new ones. Alumni find immediate value from the app and it inspires them to use it as part of their recovery. By using CaredFor, treatment centers are better able to support their alumni, leading to improved outcomes and increased referrals. Inspirations: Having a content strategy for engaging your alumni is critical for the long term success of your program. Your content strategy may include long form recovery topics, upcoming alumni events, conversations / topics, and our newly introduced inspirations. Inspirations are quotes or graphics which are automatically posted to the stream. This feature offers another prompt for your alumni to open the app to read what’s been posted, comment on another post, or create a question for the group. Announcements: Our clients have told us that it’s often difficult to communicate upcoming events or other information to their alumni. Email addresses may bounce and phone numbers change making the process of staying connected difficult. Our announcements feature allows the treatment center to broadcast updates directly to their alumni who are using the app. When creating the announcement, admins can select a level of urgency which controls push notifications and the priority of in-app display. 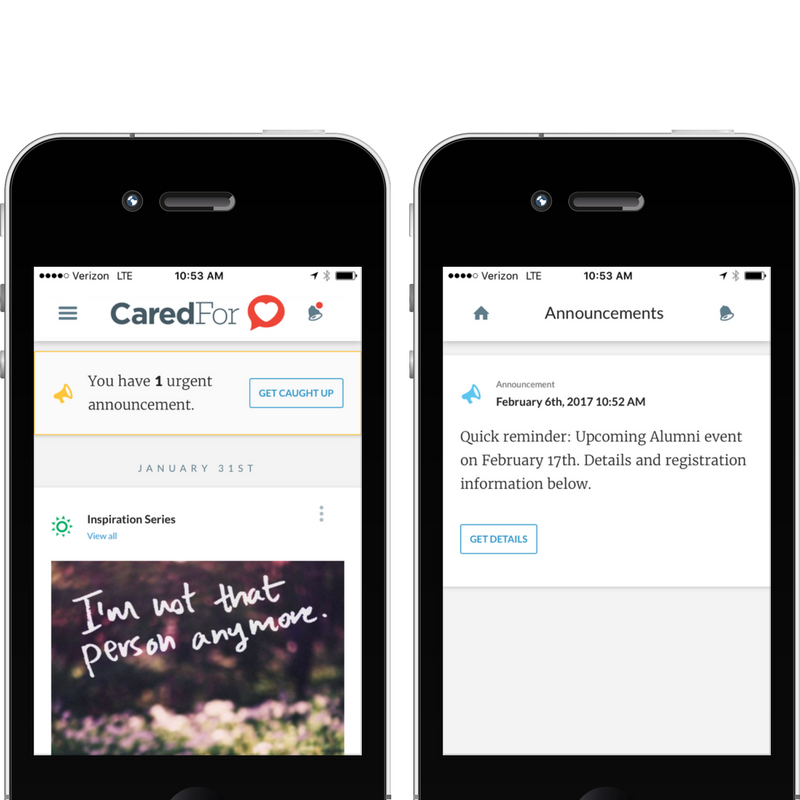 Since your alumni are already connected and engaged with your branded CaredFor app, this feature provides you with a tool to enhance your current email and text-message campaigns. Engagement: Do you ever wonder if your alumni are engaging with the content you’re creating or the email campaigns you’re sending? When working with our clients, we stress the importance of knowing how their alumni are engaging with their CaredFor app. Our analytics dashboard provides that information with easy to understand views. 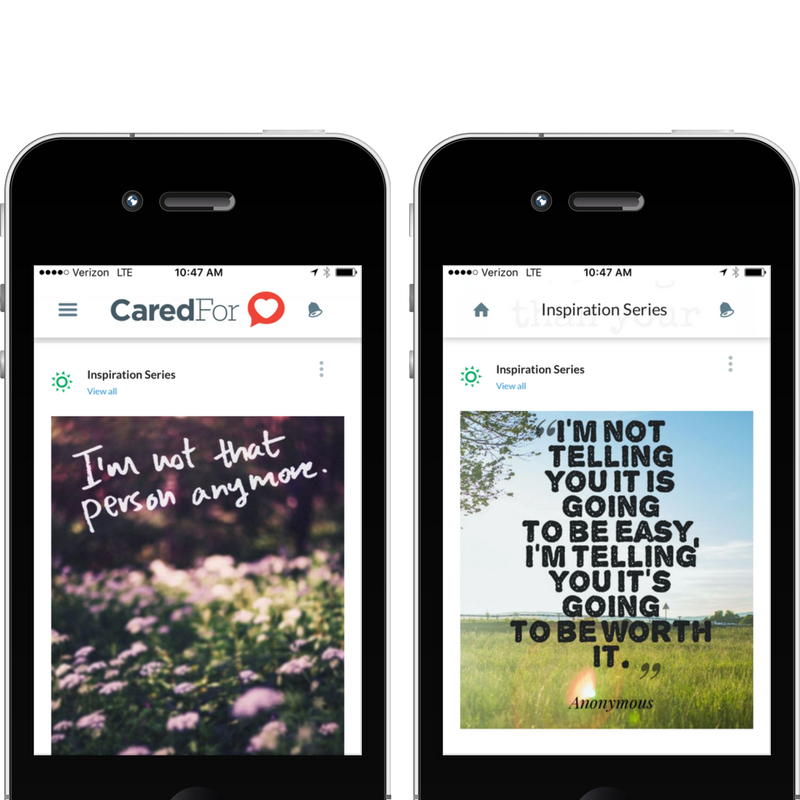 Want to experience the CaredFor app as an alumni? Download our app and "request access" to our demo alumni group. Here you can experience our core features and see how it can benefit your alumni. 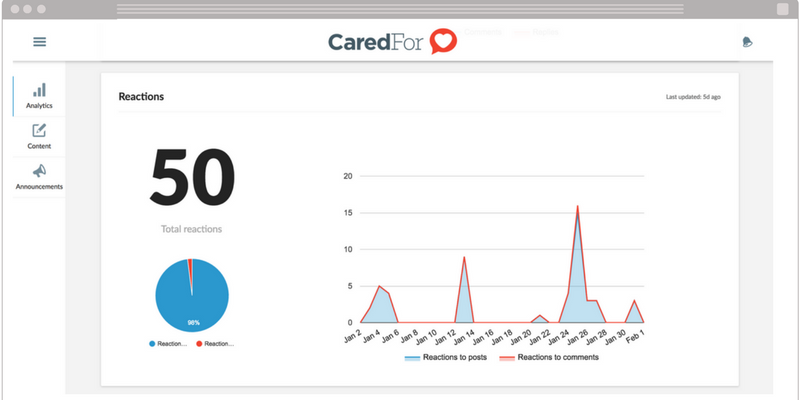 Once we've got your attention, we can setup a demo to talk about creating your own branded CaredFor app.